During the holidays, it seems as though everything between Echo Park real estate and Hollywood Hills is decked out in festive spirit. Whether you’re looking for upcoming or last minute holidays plans in Echo Park, or the best New Years Eve events around Los Angeles, there’s a little something for everyone. We’ve compiled a list of some of the best holiday events in Echo Park and the surrounding area. And as you’ll see, you don’t have to go too far to have fun! There’s no real snow in Los Angeles, but Snow Day L.A. makes the most of a holiday staple. Hosted by Snow Day Los Angeles, visitors will have fun tubing down winter-themed synthetic tube lanes along the giant hills of The Old Lodge at Montecillo De Leo Politi Park. 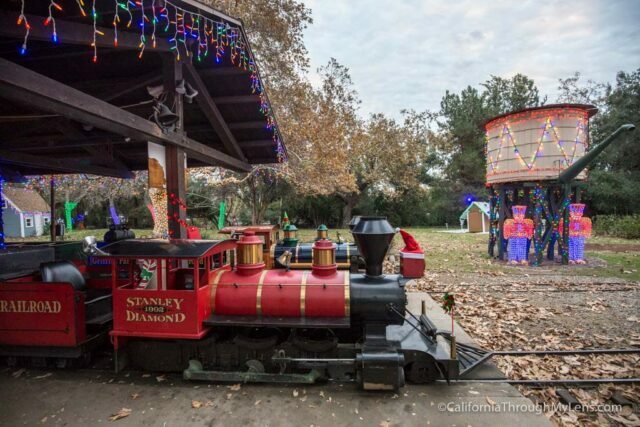 Just five minutes from downtown LA, you’ll be able to whiz down hills decorated with twinkling trees, falling snow, and brightly lit archways. And that’s not all: in addition to the tubing lanes, there will also be a giant snow globe photo booth, games, VIP Penguin Lounge (where you’ll get a free penguin onesie), and winter skating rink. Purchase tickets here. Christmas is the season of giving, and you can support local independent designers and artists at this winter holiday shopping festival. There will be hundreds of hand-crafted goods, gourmet bites, cocktails, and live music. This is a great opportunity to check out the local artisan craft community and make a difference. For event information and a full list of artists, click here. The 2017 Holiday Light Festival Train Ride begins the day after Thanksgiving and goes on until December 23rd. The event is perfect for families, and follows along an elaborately decorated mile of track. This magical scene will be decked out with tens of thousands of lights to get you fully immersed in the Christmas spirit. The first train heads out at 5pm each day, and the last train leaves at 8 or 9pm depending on the day. “Beauty and the Beast: A Christmas Rose” is a Christmas-themed, updated version of Disney’s classic “Beauty & The Beast” tale. The play is executed in traditional British Panto style and the a handful of the dancers hail from the television show “So You Think You Can Dance.” It retains the same magic from the Disney version while adding a little more comedic twist. The show is directed by Tony Award-nominee Sheldon Epps and choreographed by Mandy Moore, and has a slew of other well-known creatives behind it. . Considered the West Coast’s flagship New Year’s Eve celebration, at N.Y.E.L.A. you can bring in the New Years alongside thousands of other fellow Los Angeles residents. The countdown will be light-projected onto City Hall, and you can expect plenty of live music, food, photo booths, and dancing throughout the event. Check out more information about the event here. Who doesn’t love a well-executed themed party? For the sixth year in a row, Prohibition NYE is just that. With live DJs, jazz music, burlesque dancers, custom cocktails, and stylish Roaring Twenties attire. A 60-foot custom ball will be dropped at midnight, and the party will commence. Join in on the majestic celebration at Union Station this New Years. The Queen Mary has a little something for everyone. Hop aboard the boat and you can enjoy live performances, food, and drinks in a mellow atmosphere, or ring in the new year with a little more excitement in a club-like setting. The soiree will feature Sir Mix A Lot, Los Chicos Del 512, and a Selena Tribute Band. At midnight, enjoy a bright display of fireworks over the water.